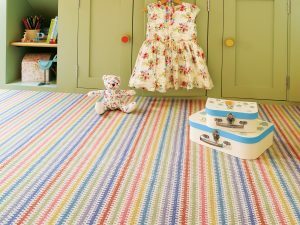 Adam Carpets have just brought out three new stripe ranges to intrigue and engage their customers and create an interesting and varied home environment. PINSTRIPE is inspired by city life and tailoring and stands apart from the rest because of its creative combination of twist and velvet yarn that is tailored to give a smart, clean, sharply defined stripe. The six colourways are fashionable but timeless, with the lipstick red and aqua to become a new modern classic which is fresh and fun loving. DECKCHAIR has been inspired by the trend ‘Maximalism’, a reaction against austerity. Maximalism means more vivid colour, a mix of texture and more fun. Silver Sands and Lulworth Cove are both colourways of calm combined with blues from the coast. PANACHE has a broken design effect allowing the colours to ‘blend’ and become a harmony of colour. It’s a carpet that can be a subtle backdrop as well as make a statement in any room. There are a mixture of colourways available. Some with vibrant, bold colours and clashing hues, others are calming and use the emergence of new neutrals, such as russet, ochre, caramel and cream. Chateau is their nod to retro, with avocado mixed with other 1970’s colours, this time with a more delicate touch. 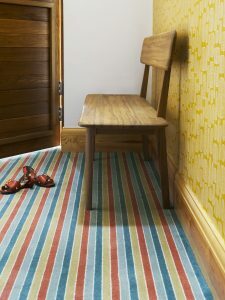 Adam Carpets’ new stripe range issuitable for all areas of the home including stairs and is manufactured in their Kidderminster factory with a blend of 80% finest UK wool and 20% best nylon.